Recently I witnessed a couple of artists struggling to hang artwork. They would “eyeball it” – hang a couple of pieces, and when the pieces were not level, they would adjust the nails, putting unnecessary holes in the wall, causing frustration, and wasting a lot of time. I’ve hung many shows with art groups, hung a lot of my own shows, and I’ve been a gallery assistant. I’ve learned a few tricks about hanging artwork quickly and easily. If you’re like me, you majored in art so you wouldn’t have to do math. And while you really don’t need all that algebra you learned, you do need to be able to do some basic adding and subtracting. So buck up, little artists! Luckily, we’re allowed to use calculators out here in the real world. Prepare your artwork for installation by attaching wire to the backs. Saw-tooth hangers are not reliable (and you won’t appear professional if you use them). It’s also recommended to put little rubber or felt pads on the back of the piece at the bottom. This helps to protect the wall from any paint rubbing off the frame. A bonus with the rubber ones – the can help keep the piece in place as you’re adjusting for level. In some cases wire is not an option. You may need to hang the artwork using screws or you might need to make some sort of cleat. That’s a topic for another post. Bring all your prepared artwork to the space where it will hang. Start by spreading out the pieces and putting them against the wall where you think they might look good. Move the pieces around until you think they look perfect. Enlist an objective person to help with this. 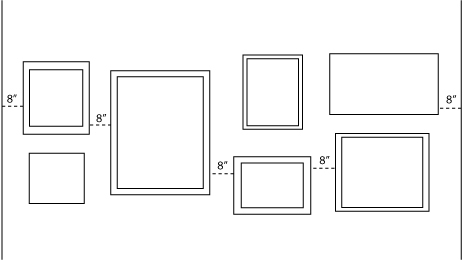 Some things to consider – mixing up or grouping the artwork according to size, color, or theme. Some artists like to include one particularly strong piece on each wall. You might also consider hanging your strongest piece in the spot where the viewer will see it first upon entering the space. OK, so now you have everything in its perfect spot. Let’s get it on the walls. 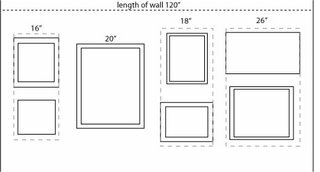 Most artwork is best viewed with the center at eye level, which is usually at 60” from the floor. 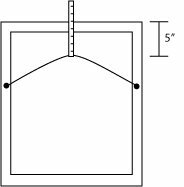 If you are hanging many pieces (and especially if you are hanging salon-style), it’s helpful to have a guide at the center point. 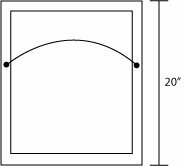 You can create a guide by stretching a string across the wall at 60” (hang the string with nails or thumb tacks). Keep in mind that the wires will most likely be at different places on each piece, so you’ll need to measure the wire each time. You’ll probably want to measure the distance between pieces, too, especially if they’re very close together. Measure 28” from the edge of the first piece. You’ll definitely want a string at 60” for this method. Arrange all the paintings on the floor so that you’re happy with the way they work together. Measure the horizontal lengths of the paintings and add them together. If there are paintings stacked on top of each other (we’ll call these a set), measure the widest one. Divide 40 by 5: 8 This is the amount of space that you will leave between sets of paintings and the walls. 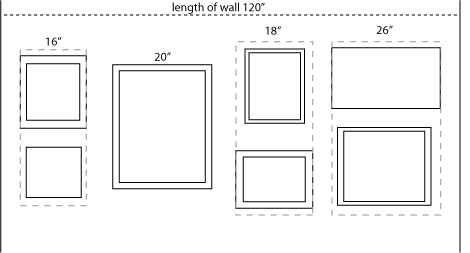 Now decide how much space you want to put between the stacked or vertical pieces: We’ll choose 4”. This is where the top of the upper piece will be. This is where the hook will go for the upper piece. Measure down 7” from the bottom of the upper piece. This is where you put the hook for the lower piece. 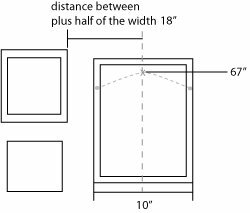 To hang the next set of paintings, measure the width of the next set: in our case we only have one painting, and it’s 20” wide. Measure 18” from the edge of the widest piece in the first set. Then measure up 67” (using the method we used earlier). Continue on for each set. 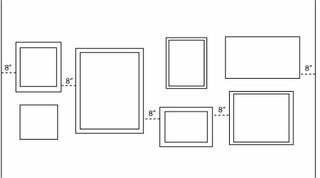 This method also works for diptychs, triptychs, and other multi-paneled works. Once the artwork is in place, adjust the lighting. Climb up the ladder and adjust the spotlights so that the lighting is even over each piece. Lighting will vary from space to space. Some galleries have better lighting than others. Some galleries will provide you with numbers to put on the wall that correspond to a price list. If you’re doing it yourself, you might want to make some labels. I prefer the clear address labels that you can get at office supply stores. Most galleries won’t put prices on the wall labels but will have a price list available for viewers to peruse on their own. Create a list that includes title, media, size, and price. I hope this makes sense. It’s much easier to show someone how to do it than to try to write it all out.